Even with offices in 138 countries, each BDO Member Firm is locally owned and managed, albeit following general guidelines laid down by the network. The company in Belgium, with its own niche in the market based on excellent customer service at the right price, is doing well. One of its current focuses is helping young entrepreneurs see the possibilities of taking ownership of their company by buying into an older established firm. BDO Belgium is one of the country’s accountancy success stories. With 500 staff, 9 offices and a turnover of over €50 million last year, they are proving that, whatever the difficulties in the current economy, there is still space for a client-focussed enterprise to flourish. Spanning 138 countries, each BDO Member Firm is owned by its local partners, yet the firm as a whole remains synonymous with a particular brand of client and staff loyalty. Their emphasis on providing a passionate, personal service for clients and a generous, inclusive attitude towards staff has seen the company go from success to success over the past decade. 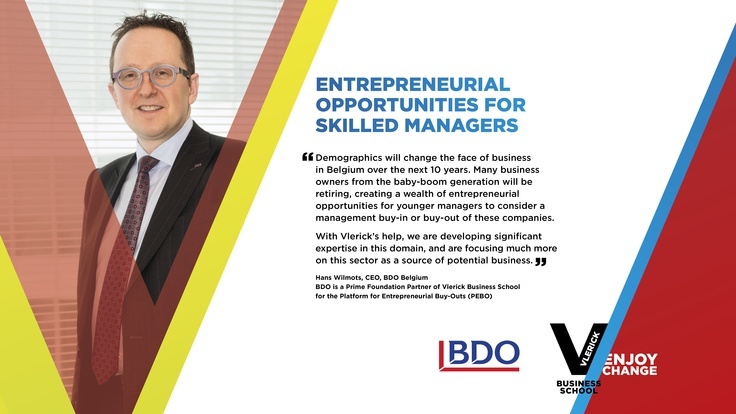 BDO Belgium has existed since 1967, but it is in part their recent partnership with Vlerick Business School that has propelled the company into the spotlight. We caught up with Hans Wilmots, CEO at BDO Belgium, to see what he had to say about the collaboration.